Have you met Helen, Sue, Mona, RJ, Esmaeil, or Mitra? Helen lives in the neighborhood and she’s the one you can thank for all the bread and goodies on Sunday. She is active in the schools assisting the teachers and passing on her knowledge. Sue used to live in the neighborhood when she first moved to Seattle from Texas to help care for her granddaughter. Mona and RJ live across the I-90 bridge. Mona found First Pres because she was looking for a church that was easy to access. She invited RJ to come with her when they were dating and they recently have gotten married. You’ll see Sue and Mona greeting at the door and also helping serve the lunch. Esmaeil is our building manager. You usually see him running around on Sunday morning, and then joining in worship at the back in case there is a problem. His wife, Mitra, is the person to thank for the delicious lunch each week. These are just a few of the members that have been at First Pres. for a number of years. They all have interesting stories about their own journey and how they came to be at this particular church. I want to encourage you to say hi and share your own story. Doing just that is what building the kin-dom is all about. While Pastor Heidi is away this summer, we will be having several other pastors filling in for the sermon time together. This Sunday Rev. Dr. Vonna Thomas will be leading us through Mark 6:1-13. 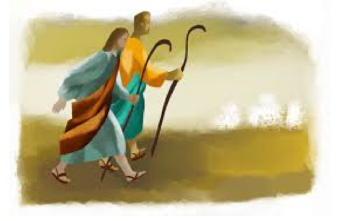 Jesus goes home, but doesn’t get the response you would be expecting and then sends his disciples out with only a walking stick!